Script writers: Kublickiy G., Troshkin V. P.
Operators: Voinov O., Gorbunov V., Skoba A., Troshkin V. P.
By the fates of concrete heroes the film tells about achievements of the country which passed a 60-year-old way after the victory of the Great October Socialist Revolution (1917). 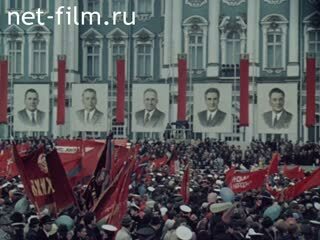 The film is dedicated to the 60 anniversary of the October Revolution, tells about people working professions, about the participants of the October Revolution. May Day demonstration in Leningrad. Brigadier fitters Leningrad Metallurgical Plant, deputy V. Chicherov At a meeting of the Supreme Soviet of the RSFSR in the Kremlin, in the shop of the plant for manufacturing of hydro turbines for Sayan-Shushenskaya hydroelectric power station, the streets of Leningrad by the builder of the Sayan-Shushenskaya GES V. Poznyakova, in the shop of the plant . Construction of the Sayan-Shushensk, Krasnoyarsk, Nurek HPP. Landscapes of Siberia: the wild rosemary, chamomile river. Memorial museum of Lenin in the village of Shushenskoye. B. Chicherov and B. Poznyakov summarizing the results of socialist competition, in the museum. Veteran of World War II colonel in the SI Makovsky at a meeting with the young pilots. VIII Congress of the Soviets. Supports GM Krzyzanowski. SI Makovsky on the construction of the Dnieper, the lessons in flying school. Newsreel. The Great Patriotic War. Air battle. Makovsky at the plane. Victory Day. Pass veterans, among them SI Makovsky. M. Dovzhik on new land development in Kazakhstan. Chronicle. Brezhnev is not virgin land. They come first virgin landers. M. Dovzhik on a tractor, among virgin soil. Harvesting. M. Dovzhik and Nurgambul Malgazhdarov in the field. Handing flag brigade M. Dovzhik. Chronicle. The Kazakhs are working in the desert. Coal. Metallurgical Plant, pouring steel. Start space rocket. 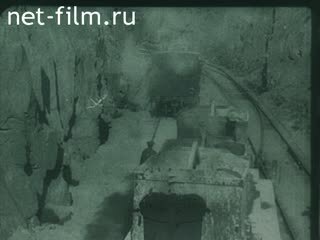 Construction of the Baikal-Amur Railway. V. lacquer on the construction of BAM, on the construction of roads in Chile, at a meeting of the Supreme Soviet in the Kremlin, at a meeting of XVII Congress of the Komsomol, congratulated the newlyweds. Demonstrations in honor of October in the streets of Zaporozhye, at BAM, on the streets of Moscow. May Day demonstration in Leningrad. Protesters walk past the monument to VI Lenin, carrying banners - different. Session of the Supreme Soviet of the RSFSR and delivers foreman fitters Leningrad Metal Works deputy Vladimir Stepanovich Chicherov (synchronously). The inscription on the gun "Aurora", "bowman weapon from which a shot is made historic October 25, 1917 at the time of the taking of the Winter Palace» - CU. VS Chicherov and carpenter, concrete worker from Siberia Valery Poznyakov the cruiser "Aurora", in front of the Smolny Institute, Leningrad, walking on the street - are different. Neva is a boat - LS. (Summer). B. and B. Chicherov Poznyakov at Leningrad Metal Plant, V. Chicherov welding of - MS. The workers at work - MS., CU. B. Chicherov and designer for ski competitions - CU., PNRM. The construction of the power plant - different. (Winter). V. Pozniak is on a construction site - CU. Construction of the Krasnoyarsk hydroelectric power station V. Poznyak for construction. Workers at the portrait of Yuri Gagarin - CU., LS. V. Pozniak near the Kremlin walls; writing on the wall "Yuri Gagarin. September 19 - 34 - 19 27 68. " Nurek HPP in Tajikistan - LS., PNRM. (Top point). Machinery (trucks) pass, poured earth - MS., PNRM., (Summer). The monument - a tent in Divnogorsk, new homes - CU., MS., Departure. Turbine Hall of the Krasnoyarsk HPP - LS. Boat lift - LS., PNRM., CU., Departure. V. Pozniak with his sons and other construction workers at the dam - CU., Hitting. Flowering rosemary - CU., MS., PNRM. The Sayano-Shushenskaya HPP. Daisies by the River - CU. The water in the Yenisei - CU. Lesson literary association the power plant, and members of association read poetry (synchronous), V. Poznyak for classes - CU., LS., Hitting. Plaque with the inscription: "VI Lenin, following in Siberian exile from St.
Petersburg to Shushenskoye, was in transit in one day "," In this house lived leader of the world proletariat, Vladimir Ilyich Lenin 1898-1900 gg »- CU. House in Shusha, where he lived VI Lenin (summer) - LS. Table lamp in the house - CU. A pillar with the inscription: "To St.
Petersburg 5924 mile» - CU. The construction of the power plant (winter) - LS. B. Chicherov talks to students at vocational schools Leningrad Metal Plant (synchronously). Departments of the factory, the workers at work, manufacture of turbines - are different. B. Chicherov and his team at work - different. Summing up by socialist competition foremen competing teams and V. V. Chicherov Poznyakov exchanged souvenirs - CU., Departure. Snowy streets of Leningrad, the bridges over the canals, ground wind is blowing - different. Atlanta at the Hermitage - CU. Double Exposure: through the fire removed monuments of the Great Patriotic War - CU., PNRM. B. and B. Chicherov Poznyakov outside Leningrad have a sign reading: "Citizens for shelling this side of the street is the most dangerous» - CU. Ruined wall - CU., PNRM. B. and B. Chicheri Poznyakov in the museum of Leningrad. The exhibits of the museum: the things of war, blockade, and other bread - CU. 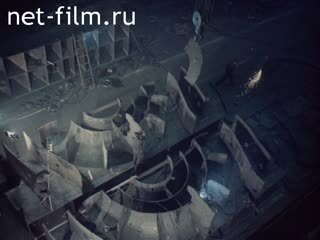 Animation: photos of Leningrad Military - CU. (With the influx, shot through the fire). Piskarevsky, monument "Motherland» - LS., (Shot through the fire), departure. Kiev: a meeting of students of military flight school with Col.
Spartacus Iosifovich Makovsky, a veteran of World War II and delivers SI Makovsky, students listen. Photos of young S. Makovsky (wartime). SI Makovsky is the grandson of the park at the mall - CU. Grandson of SI Makovsky, a small Spartak, runs along the avenue is home with airplane - CU. SI Makovsky is reading a story to her grandson (synchronous) - CU. Photo father SI Makovsky - revolutionary Joseph Ivanovich Makovsky, a passage from his autobiography (multrabota), photographs of the revolutionary period: Red Guards, demonstrations, shooting demonstrators, funeral shot. A document from the case II Makovsky, wounded the Whites - CU. Photo II Makovsky - kr. QUESTIONNAIRE delegate VIII Congress of Soviets I. Makovsky - kr. The influx of photos: the building of the Bolshoi Theater, which hosted the congress, GM Krzyzanowski at the Congress of Soviets. Multrabota: turned over plan of electrification of the USSR - kr. Photo: Room VI Lenin in the Kremlin, a desk, VIII Congress of the delegates. GM Krzyzanowski speaks at VIII Congress of the Soviets; delegates. The construction of the Dnieper, the workers at work, the engine rides on rails, rally, brass band, playing trumpets, rides the train with builders. Photos Spartacus Makovsky - schoolboy, cadet flying school, the military. Flying school, students are trained. Family Photo Makovsky; Autobiography II Makovsky (multrabota) - kr. The bombings, power plants, flies a plane explodes; hit anti-aircraft guns. [_] Photo: S. Makovsky and saved them the pilot, Lieutenant V. Kuznetsov. The soldiers smoke, run away. Spartak Makovsky with his mother at the grave of his father - kr. Journal article on AI Makovsky and his photograph - kr. [_] Tomb II Makovsky with the inscription: "Makovsky, Joseph I. 1895 - 1945" - cr. Photo: S. Makovsky and his wife during the war, after the war, with his sons at work. Home for the Holidays at Makovsky, pilot Viktor Kuznetsov on holiday. [_] The celebration of the birth of S. Makovsky, Makovsky's sons - kr. C. Makovsky and his grandson extinguish candles - kr. Family C. Makovsky at the grave of J. Makovsky, grandchildren put flowers on the grave - Various. Elevator - kr. (the plane). Harvest in Kazakhstan - Society. (the plane). On the road going cars with grain - commonly. (the plane). Pervotselinnik, Hero of Socialist Labor - Michael Dovzhik in the field with seedlings - Society. Hall CU.emlevskogo Palace of Congresses - LS., PNRM. LI stands Brezhnev on virgin soil (synchronously). Field with seedlings, strong wind - LS. Of virgin in Kazakhstan - are trailers, tractor ride - LS., PNRM. Tselinnik with things going on the tractor trailer - CU. Kazakhs ride on camels - MS., PNRM. People pull out a stuck truck - CU., PNRM. The first furrow in the virgin lands - LS. Young M. Dovzhik a tractor talking to virgin soil. Little House in the evening - MS.
M. Dovzhik talking to his mother Mary Kiryanovnoy - CU., LS. Son M. Dovzhikov plays - CU. ; M. Dovzhik son. The first tent on the State Farm - LS. Planting trees pass buckets of water - CU., LS., PNRM. 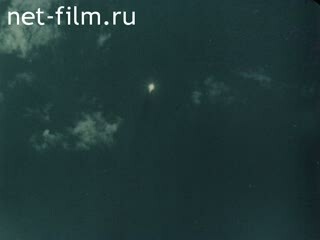 [_] ME Dovzhik in the screening room tells the story of the early development of virgin land (synchronous) - CU. Girl watering flowers in the house - MS.
September 1. Girl rings the bell - CU. Children give flowers teacher - LS. Children in the nursery - CU. Tent in the Museum of the Revolution, the inscription "Parliament, in which the team of Michael Dovzhikov lived. 1954 »- CU. (Moscow). M. Dovzhik with his son in the field, check the grain, helps repair harvester - different. Son Vladimir M. Dovzhikov in the field, on the tractor - CU. (State Farm Shumsky). Hero of Socialist Labor, the foreman of the state farm "Lakeside" Nurgambul Malgazhdarov competing with M. Dovzhikov in the field, on the trailer Harvester - MS., CU. Spilling grain on the threshing - CU. Evening and morning cleaning plans - LS. Handing Banner Brigade M. Dovzhikov - MS., PNRM. M. and N. Dovzhik Malgazhdarov in the field, examining sprouts - different. M. Dovzhik visiting N. Malgazhdarova - different. Playing on the lute - CU. (Background song in Kazakh). The desert, the Cossacks work in the desert, take out the water, the woman in the tent; camels driven boards are bales, making bricks from clay. [_] Installation plans, showing the success of the industry and agriculture of the Kazakh SSR. Installation plans, showing the success of the industry of the Kazakh SSR. Launch of rockets - LS., PNRM., Departure. Girls holding poster "Arkalyk - Space Harbor» - LS., Departure. Snow-covered taiga - LS. (Helicopter). Line BAM - LS., (Helicopter). The pilots in the cockpit of a helicopter - MS.
Construction of the Baikal-Amur Mainline - LS. (Helicopter). Brigadier Victor paint on construction of BAM - CU., MS.; Rides on a trolley with a team - CU., LS. B. Lakomov at the airport and the plane before the trip to New York - MS.
MP V. lacquer and other passes on the St George CU.emlya room, in the conference room of the Supreme Soviet of the USSR, held on the streets of Moscow - different. BAM builders at the newsstand - LS. Holiday to winter at BAM, passing children on the top three - LS., PNRM. ; Plays harmonica - CU. ; Grilled kebabs. V. paint on holiday - MS. Dancing Santa Claus, Snow White and others - LS., MS. The young man gets from the post boots - LS. Skating on triples - LS., PNRM. (Top point). Winter dawn in the forest - LS. B. Lakomova team goes to work gets in the van - MS., PNRM. B. Lakomov and his team are going to work in a trailer - different. Magazine "Changing with photos about BAM» - CU. Railroad - MS., (From a moving train). 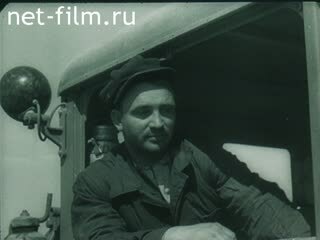 Construction of the railway in Chile with the help of Soviet specialists - MS., CU., PNRM., Freeze-frame. [_] The book "Railways of Chile" (in Spanish) - CU. Chileans on the sidelines of the XVII Congress of the Komsomol, V. Lakomov MS.edi Chileans - CU. The delegates in the hall of the Palace of Congresses - LS., PNRM. Komsomol detachment commander volunteers B. Lakomovu handed banner - CU., Freeze-frame. Seeing the first team at the station, departing at BAM, the symbolic key. Helicopter lands with the first builders of BAM - LS. Work first builders - cut the track. The car pulled out of the mud. Construction of bridges, roads, tunnels. V. paint and other construction workers at work. A sign with the words "Chief MSP - 288 Miller RG» - MS.
RG Miller's office tells B. Lakomove (synchronous) - CU. B. Lakomov and his team at work on the laying of rails - different. Hands holding a glass and a branch of rowan - CU. Wedding at BAM: V. Lakomov congratulates children (synchronously). Newlyweds dancing - CU., MS. Plays a variety ensemble - different. Children look out the window - CU. Laying tracks - LS. (Helicopter). B. Works with lacquer and members of his team - MS. Passing trains - LS. (Helicopter). Railroad - LS. (With motion, winter). Laying the last link of the path of the "Silver Rail": stand builders - from Georgia and other republics, held up signs in different languages, balls and so on. - LS., PNRM. B. Lakomova team at work - LS. B. Lakomova congratulate, swing, presented with "bread - salt" horn with wine - LS., MS.
Builders applaud - LS., PNRM. May Day demonstration in BAM, carrying a banner "Construction and Installation train № 268» - LS. Demonstration in the streets of Leningrad - LS. May Day demonstration on the streets of Zaporozhye - Various. S. Makovsky and grandson of demonstrators - CU. The meeting at the Sayano-Shushenskaya HPP, the May Day demonstration, held Komsomol youth team builders them. Gagarin headed by V. Poznyakova - LS., PNRM. The demonstration on the streets of Moscow on Red Square, M. Dovzhik of demonstrators - CU., LS. (Top point).